"Stamp Collecting" redirects here. For the defunct British magazine, see Stamp Collecting (magazine). Stamp collecting is the collecting of postage stamps and related objects. It is related to philately, which is the study of stamps. It has been one of the world's most popular hobbies since the late nineteenth century with the rapid growth of the postal service, as a never-ending stream of new stamps was produced by countries that sought to advertise their distinctiveness through their stamps. It has been suggested that John Bourke, Receiver General of Stamp Dues in Ireland, was the first collector. In 1774 he assembled a book of the existing embossed revenue stamps, ranging in value from 6 pounds to half a penny, as well as the hand stamped charge marks that were used with them. His collection is preserved in the Royal Irish Academy, Dublin. A few basic items of equipment are recommended for proper stamp collection. Stamp tongs help to handle stamps safely, a magnifying glass helps in viewing fine details and an album is a convenient way to store stamps. The stamps need to be attached to the pages of the album in some way, and stamp hinges are a cheap and simple way to do this. However, hinging stamps can damage them, thus reducing their value; today many collectors prefer more expensive hingeless mounts. Issued in various sizes, these are clear, chemically neutral thin plastic holders that open to receive stamps and are gummed on the back so that they stick to album pages. Another alternative is a stockbook, where the stamps drop into clear pockets without the need for a mount. Stamps should be stored away from light, heat and moisture or they will be damaged. Stamps can be displayed according to the collector's wishes, by country, topic, or even by size, which can create a display pleasing to the eye. There are no rules and it is entirely a matter for the individual collector to decide. Albums can be commercially purchased, downloaded or created by the collector. In the latter cases, using acid free paper provides better long-term stamp protection. A stockbook with clear plastic pockets is one of the safest ways to store stamps. Some collectors prefer a traditional stamp album. Clockwise from top left: hinge-mounted stamp, stamp about to be hinge-mounted, stamp damaged by a hinge, stamp hinges. Many collectors ask their family and friends to save stamps for them from their mail. Although the stamps received by major businesses and those kept by elderly relatives may be of international and historical interest, the stamps received from family members are often of the definitive sort. Definitives seem mundane but, considering their variety of colours, watermarks, paper differences, perforations and printing errors, they can fill many pages in a collection. Introducing either variety or specific focus to a collection can require the purchasing of stamps, either from a dealer or online. Online stamp collector clubs often contain a platform for buying/selling and trading. Large numbers of relatively recent stamps, often still attached to fragments or envelopes, may be obtained cheaply and easily. Rare and old stamps can also be obtained, but these can be very expensive. A worldwide collection would be enormous, running to thousands of volumes, and would be incredibly expensive to acquire. Many consider that Count Philipp von Ferrary's collection at the beginning of the 20th century was the most complete ever formed. Many collectors limit their collecting to particular countries, certain time periods or particular subjects (called "topicals") like birds or aircraft. 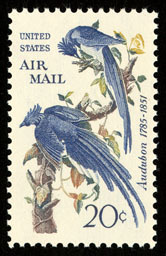 Airmail stamps – stamps may be required for airmail, which is typically more expensive and has special postage rates. Commemorative stamps – stamps to commemorate events, anniversaries, etc., on sale for a limited time. Postage due stamps are special stamps applied by a post office to mail bearing insufficient postage. The stamps were issued in several denominations to make up different amounts due. Topical stamp collecting – many collectors choose to organize their philatelic collection on the theme of the stamps, covers, or postmarks. Popular topical themes are animals, dogs, cats, butterflies, birds, flowers, art, sports, Olympics, maps, Disney, scouting, space, ships, Americana (topics relating to the US), stamps on stamps, famous people, chess, Chinese new year, and many others. Postal stationery – includes government-issued postal cards, aerograms, letter card, wrappers, envelopes, etc., that have an imprinted stamp. Sheetlets – this is a format that is now issued regularly by postal administrations. Instead of issuing stamps in large sheets of 40, 100 or even 200 stamps, smaller sheetlets with 20 to 24 stamps are issued with a large selvedge area which may incorporate part of the stamp design or theme. Miniature sheet – is very similar to a souvenir sheet, being in a sheetlet with a single or a number of stamps embedded in it. Corner blocks or plate blocks – compose a block of stamps from one of the four corners of the stamp sheet. Collectors usually opt for a block of four stamps, complete with the selvage area which will sometimes have the printing details on it. Coil strips – Pairs or more of stamps from rolls, premium ones showing the plate number or a coil line pair which shows the seam between the edges of the plate. Revenue stamps – stamps issued to pay taxes. First day cover (FDCs) – envelopes with stamps attached and canceled on the first day that the stamp was issued. Most modern FDCs bear designs, called "cachets", related to the theme of the stamp issued. Maximum cards – these are postcards where the stamp is on the same side as the picture and they have a close connection. Souvenir pages – with first day canceled stamps on a page describing all design, printing and issuing details. These are similar to first day covers except that they are issued as printed sheets of paper instead of envelopes, and the specification of the stamp is printed by the official source. See picture of first souvenir page in the US. Cinderella stamps – stamp-like labels that are not valid for postage. Postmarks or postal markings in general. There are thousands of organizations for collectors: local stamp clubs, special-interest groups, and national organizations. Most nations have a national collectors' organization, such as the American Philatelic Society in the United States. The Internet has greatly expanded the availability of information and made it easier to obtain stamps and other philatelic material. The American Topical Association (ATA) is now a part of the APS and promotes thematic collecting as well as encouraging sub-groups of numerous topics. Stamp clubs and philatelic societies can add a social aspect to stamp collecting and provide a forum where novices can meet experienced collectors. Although such organizations are often advertised in stamp magazines and online, the relatively small number of collectors – especially outside urban areas – means that a club may be difficult to set up and sustain. The Internet partially solves this problem, as the association of collectors online is not limited by geographical distance. For this reason, many highly specific stamp clubs have been established on the Web, with international membership. Organizations such as the Cinderella Stamp Club (UK) retain hundreds of members interested in a specific aspect of collecting. Social organizations, such as the Lions Club and Rotary International, have also formed stamp collecting groups specific to those stamps that are issued from many countries worldwide that display the organization's logo. The Three-Skilling Yellow of Sweden was sold for CHF 2.88 million (then about $2,300,000) in 1996 and again for an undisclosed amount in 2010. David Feldman sold this Blue Mauritius stamp for CHF 1,610,000 (approx. $1.1 million) in 1993. One of the first two Mauritius Post Office stamps. This orange stamp was sold for CHF 1,725,000 (approx $1.2 million) in 1993. Stamp catalogues are the primary tool used by serious collectors to organize their collections, and for the identification and valuation of stamps. Most stamp shops have stamp catalogues available for purchase. A few catalogues are offered on-line, either free or for a fee. There are hundreds of different catalogues, most specializing in particular countries or periods. Collector clubs tend to provide free catalogues to their members. Online catalogues typically include additional resources, such as tracking tools, trade platforms, and marketplaces. The stamp collection assembled by French-Austrian aristocrat Philipp von Ferrary (1850–1917) at the beginning of the 20th century is widely considered the most complete stamp collection ever formed (or likely to be formed). 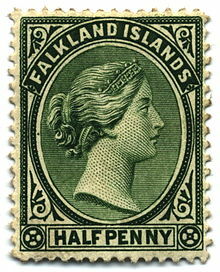 It included, for example, all of the rare stamps described above that had been issued by 1917. However, as Ferrary was an Austrian citizen, the collection was broken up and sold by the French government after the First World War, as war reparations. A close rival was Thomas Tapling (1855–1891), whose Tapling Collection was donated to the British Museum. Several European monarchs were keen stamp collectors, including King George V of the United Kingdom and King Carol II of Romania. King George V possessed one of the most valuable stamp collections in the world and became President of the Royal Philatelic Society. His collection was passed on to Queen Elizabeth II who, while not a serious philatelist, has a collection of British and Commonwealth first day covers which she started in 1952. U.S. President Franklin Delano Roosevelt was a stamp collector; he designed several American commemorative stamps during his term. Late in life Ayn Rand renewed her childhood interest in stamps and became an enthusiastic collector. Several entertainment and sport personalities have been known to be collectors. Freddie Mercury, lead singer of the band Queen, collected stamps as a child. His childhood stamp album is in the collection of the British Postal Museum & Archive. 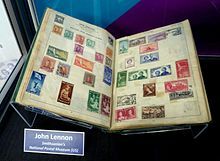 John Lennon of The Beatles was a childhood stamp collector. His stamp album is held by the National Postal Museum. Former world chess champion Anatoly Karpov has amassed a huge stamp collection over the decades, led by stamps from Belgium and Belgian Congo, that has been estimated to be worth $15 million. ^ Vickers, Marcia (15 December 1996). "Delivery Isn't Guaranteed, but Stamps Are Turning Profits". The New York Times. Retrieved 10 December 2009. ^ "What is stamp collecting?". Learn About Stamps. 2010. Retrieved 4 October 2010. ^ "The origin of stamp collecting in America, Part 1". Linn's Stamp News. 17 October 2014. Retrieved 15 July 2017. ^ "Graph: The Wide World of Stamps". WSJ.MONEY. 2013. Retrieved 24 September 2013. ^ "The history of stamp collecting". eSortment. 2010. Retrieved 4 October 2010. ^ Klug, Janet (2012). "A limited budget can still mean unlimited fun". Linns Stamp News. Retrieved 11 May 2012. ^ "Stamps on Colnect". colnect.com. Retrieved 30 March 2019. ^ "Stamp Clubs And Philatelic Societies". Stamphelp.com. Retrieved 25 October 2008. ^ "Rare stamp sells for record price in Geneva auction". BBC News. 22 May 2010. Retrieved 24 May 2010. ^ "Stamps on Colnect". colnect.com. Retrieved 18 April 2019. ^ "FDR–Stamp Collecting President". National Postal Museum. Retrieved 7 February 2010. ^ "Famous Philatelists". The British Postal Museum & Archive. Retrieved 24 July 2009. ^ "John Lennon – The Lost Album". National Postal Museum. Retrieved 24 July 2009. ^ Anatoly Karpov Belgian stamp collection offered at David Feldman, justcollecting.com, 2015. Cabeen, Richard McP. (1979). Standard Handbook of Stamp Collecting. Chicago: Collectors Club of Chicago. ISBN 0-690-01773-1. Nankivell, Edward J. (2007). Stamp Collecting as a Pastime: Stanley Gibbons Philatelic Handbooks (1902). UK: Dodo Press. ISBN 1-4065-3058-1. Free download here. StampNews.com Provides updates on new stamp issues and stamp collecting from around the world. Stamp Story, a 1955 information film about stamp collecting.